Hibernian have signed striker Eoin Doyle on a contract to the end of the 2012/13 season. 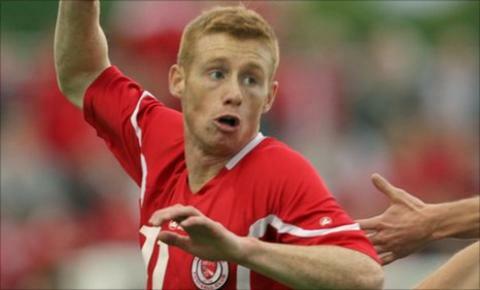 The 23-year-old arrives from Sligo Rovers and scored 25 goals for the League of Ireland outfit last term. Doyle, who has had spells at Shelbourne and Shamrock Rovers, will not be eligible to play until the transfer window opens in January. A spokesman for Sligo Rovers told BBC Scotland on Wednesday that they would be seeking compensation. Keith O'Dwyer said: "He is under 24 and we would seek clarification from the FAI and Uefa about the need to pay a training and development fee." Doyle, who scored in a closed doors game against St Johnstone this week, is new Hibernian manager Pat Fenlon's first signing. The striker dubbed "The Green Messi" by Rovers fans became a free agent after scoring in the penalty shoot-out as Sligo defeated Shelbourne in last month's FAI Cup final. Hibs have yet to score in the two matches Fenlon has overseen and Leigh Griffiths' loan spell from Wolves is due to expire next month. Another forward, Junior Agogo, has been told he is free to look for another club, along with midfielder Matt Thornhill. Doyle's former Sligo team-mate, Iarfhlaith Davoren, failed to win a move to Hibs after the defender had a trial period with the Easter Road club last week.